The Large Hadron Collider (LHC) must surely be the greatest physics experiment ever. Remarkably, you can follow the day-to-day operations of this experiment on the web, through the online dashboard. Have a look! The fascinating thing is that such a large machine is needed to study the smallest of things, elementary particles. The LHC is a particle collider that accelerates beams of protons to close to the speed of light. At several points the beams are crossed, so that they collide head-on. Each collision point is situated inside one of the detectors, which record the debris (more particles) that is produced by the proton-proton collisions. The machine itself is housed in a 27 km long tunnel that is buried between 50 and 175 meters beneath the French-Swiss border close to Geneva. When we had the chance to visit the LHC, we also explored the surroundings. The illustration below shows how this dashboard looks when a run of the experiment is being started. 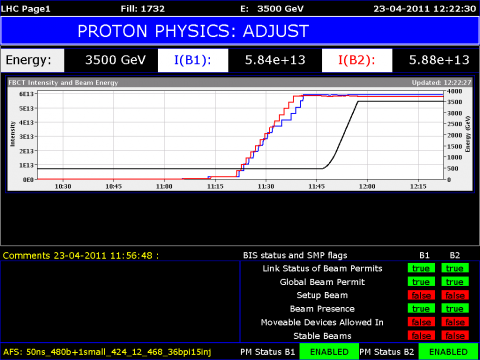 The blue and red lines show how many protons have been inserted (blue for one beam, red for the other). The protons are inserted in groups, which explains the staircase shape of these graphs. Next, the electrons are accelerated from the initial 450 GeV to 3.5 TeV, which is indicated by the black line. This whole process takes about 45 minutes. Then the actual physics starts. The beams are kept circulating (and colliding) for many hours. The illustration below shows the display after about ten hours. 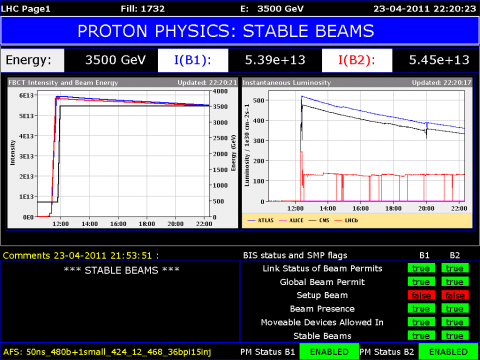 The energy of the protons is kept stable (left graph, black line), but the number of protons (left graph, blue and red lines) slowly decreases. This decrease is partly caused by the collisions themselves, but there are several other reasons too. [update] So, the Higgs particle has been found. Or, put more scientifically, a particle that seems compatible with the Standard Model Higgs particle has been found. Further investigations (on more data) will now have to determine its exact properties. Interesting times are ahead!